Home Jurassic World: Alive Jurrassic World Alive Drone/Darting Mechanics – How to collect more DNA? Jurrassic World Alive Drone/Darting Mechanics – How to collect more DNA? Full credits for this article go to Pocemon! Connect with him on our Discord server! Darting Dinos can be a frustrating process, especially if you just started. Collecting 30 or 40 DNA on Common Dinos and maybe 15 DNA on Epics may be demoralizing seeing the massive amounts of DNA needed for the Legendary hybrids like the Indominus Rex. DNA darting isn’t the easiest thing in the world. 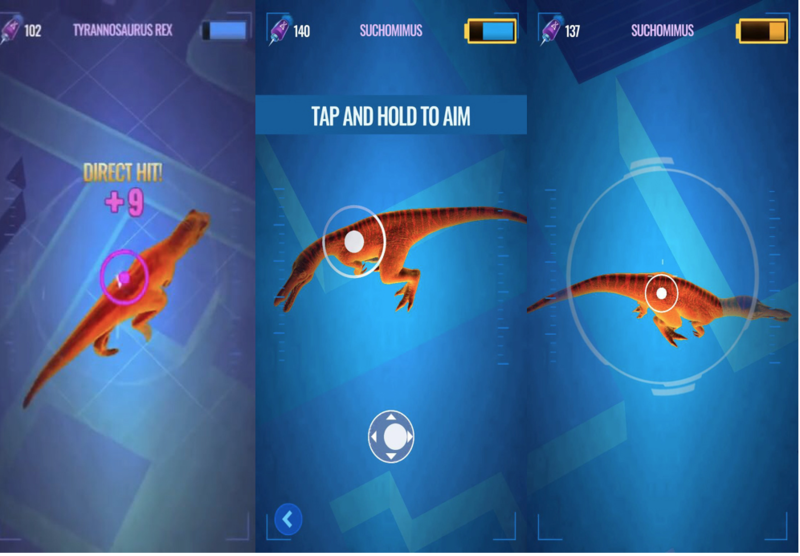 As the screen moves, the Dino runs, your crosshair shakes, it’s really difficult to get a clear shot on the bullseye. Darting skill can only be acquired through practice, experience and knowledge of the darting system. This guide might not help you get a massive 300 DNA on a Sarcosuchus, but perhaps it will help you better understand the darting sequence and progressively improve your darting skills. To know the maximum DNA you can collect from each dart, check out our Player Progression article right here! Assuming that you’ve already read the basics of darting from Crotalus’s article, which can be found here, you should have a very basic understanding of the drone and darting mechanics. This article will provide you with 3 tips for better darting skills. Overall, if you’re running around, darting Dinos, moving outside a lot; a phone is certainly more convenient. But when given the circumstances, larger screens will help you tremendously during darting sequences. The larger screens give you a better view of the bullseye and help having your finger further away from the target. In addition, the gestures made on the tablet are a slightly smaller than on the phone, so there are benefits to use a tablet over a phone. The reason Commons are relatively easier to get is because targets will more likely appear on or near the same location as the previous target. Therefore, you will often end up darting exclusively the back of a Dino, or only it’s head for the whole sequence. When it comes to Rares, a more commonly found pattern is that the target starts switching locations more often. The most common pattern (known so far) is switching to the next closest body part. For example: head > body > tail > body > head. Then the cycle repeats itself. This is slightly more challenging as you will have to move you finger further away from the last target position which can result in sometimes getting off track or slipping off the sides of the Dino. Epic Dinosaurs are something else. The reason why epics are so hard to dart is due to their most common target pattern often being head > tail > head > tail. In comparison to the rare pattern, which has a shorter gesture distance, the gap between the head and the tail can be quite wide. Another influencing factor is the length of the Dino. Some of you might have already noticed that even some Dinos from the same rarity Tier can be more difficult to dart than others. For example, Allosaurus has a long body, which sets it apart from Nundasuchus, which has all it’s targets condensed to a smaller area. One final advice: We strongly suggest to keep of room between the target and your aim so the Dino will walk right through it. Worry not! Even if you miss all your shots, it appears that you can reset your sequence entirely (this is known as a glitch). Pre-update, when batteries were still a thing, you could take an L and exit the session on the bottom left corner and retry. The Dino would still be there and you would only have wasted some darts and a battery. Post-update, due to popular demand, batteries were removed along with the exit button once the first dart is shot. However, there still appears to be a way around this. It seems that resetting your app before the timer finishes will bring you back to the map, without having lost any darts! However, a risk remains as the Dino might no longer be there. Therefore, try at your own risks! This is a really great trick if you missed that first bullseye on that glorious Tyrannosaurus Rex or if you’re almost out of time and you think you could do a better job. Practice makes perfect. This on its own sums it all up. This article can help you better under the darting mechanics, but the best way to collect more DNA is truly through practice. If you want to share your own tricks, simply join the discussion on our Discord server! We don’t bite!